Let it be known that I did it for the lolz. It was one of those things I thought maybe would make a handful of friends laugh. Some background: I’ve been nursing a growing addiction to going to WWE shows. It’s the strangest form of entertainment, with energy unlike any show or sporting event I’ve ever witnessed live. Going to a WWE show is like watching a gladiator match in Rome or Shakespeare in the Round, where everyone is a groundling amped up on beer, Red Bull, and the purely kinetic drama played out in the squared circle with flying jump kicks. It’s a fun time, and when seated at a wrestling show I feel oddly at home. So I headed to a taping of Smackdown up in Manchester, New Hampshire and this time I decided to take my role as WWE audience member one step further and embark on the time-honored tradition of bringing some goofy signs. WWE signs run the gamut, ranging from shoutouts to favorite performers, references to WWE legends of the past, or just random junk. I went the random junk route. Mother 3 had just recently marked ten years since its release in Japan, and I think that’s why it was in my head. Yearning for its release here in the US was one of those long simmering items on the docket of Nintendo nerds. Seemed like as good a time as any to raise the battle flag for localization. One magic marker and poster board later, I had my totem for Smackdown. I also made one that read JOHN CENA IS REY’S DAD, because Star Wars. Loaded with my signs, my brother-in-law and I ventured north to New Hampshire to take in Smackdown. It was a really good show, packed with great matches. Our seats were dope, located right behind the announcer table. I was just feet away from Jerry “The King” Lawler, wrestling legend and infamous foil of Andy Kaufman! The cameras weren’t really focused on our section though, so I thought my chances of getting the sign on TV were slim. Then midway through the show, the trio of New Day took over the announcing booth, followed by a swarm of camera operators. If there was any chance, this was it. I flew my signs, loud and proud. And that was it. The show went on, we ate our nachos and and took it in with the rest of the crowd. Everyone around was drunk and rowdy, constantly yelling ridiculous things at the performers. It was pure WWE. The next day, I headed off to Vermont for a short getaway with my wife, a couple days at a spa retreat for some R&R away from technology and whatever. I thought maybe I’d tune into Smackdown on Thursday, catch a shot of the sign, send it to my friends, have some laughs. I was surprised when the notifications started rolling in early Thursday. Unbeknown to me, Smackdown was already airing in the UK. 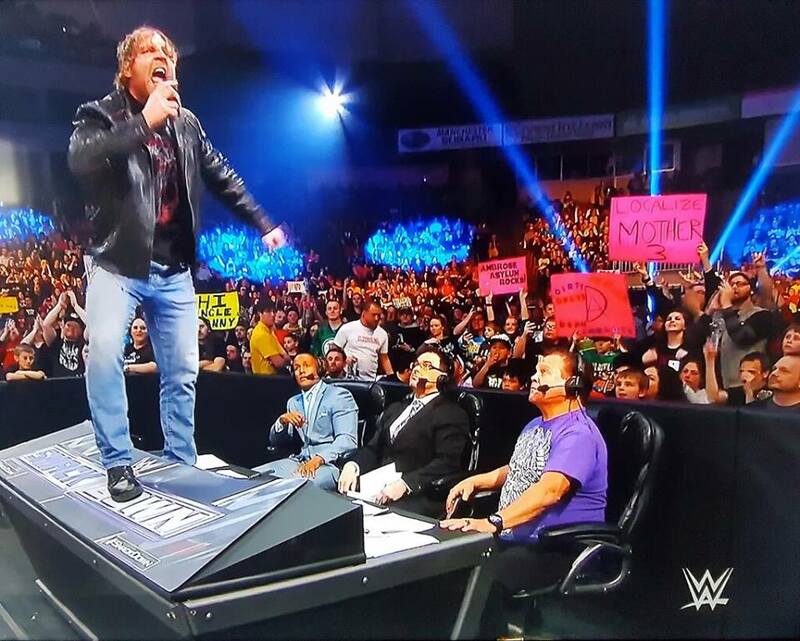 A British wrestling fan saw the sign, took a picture of it from the broadcast, and circulated it on Twitter. It gained nearly a thousand retweets. The “story”, if if can even be called that, then made its way onto gaming forums like NeoGAF and Gamefaqs. Reaction ranged from “This guy is a hero” to “what an idiot.” I appreciated both points of view. Things went full-on surreal bonkers when Kotaku, one of the biggest video game websites online (maybe the biggest?) published an article on the Localize Mother 3 sign. Someone got paid to write an article about my silly video game inspired WWE sign. The article gained 24.5K views and garnered reaction around the globe. UK, Spain, Italy, France, Germany- the Localize Mother 3 sign was a worldwide phenomenon. 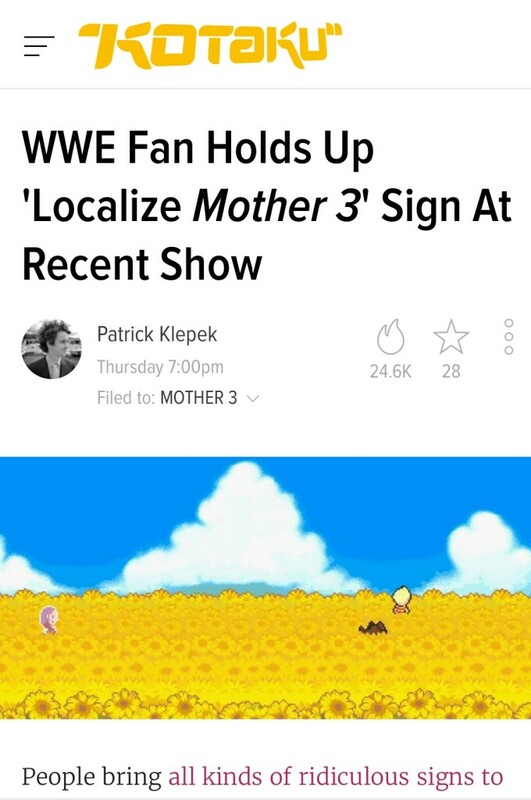 While the viral spreading was interesting to see, it was the tweets from the masses are what really made the Localize Mother 3 sign worthwhile. “Not all heroes wear capes” read more than one. “Greatest thing I have ever seen” read others. Throughout it all, I remained pretty much anonymous. It wasn’t Erik Radvon the world needed, it was the Localize Mother 3 sign. I was simply its vessel, the meat puppet to bring it to life and hold it forth for the world entire. I finally understood the end of Christopher Nolan’s The Dark Knight. The hero gaming deserves, but not the one they need right now. The silent guardian. 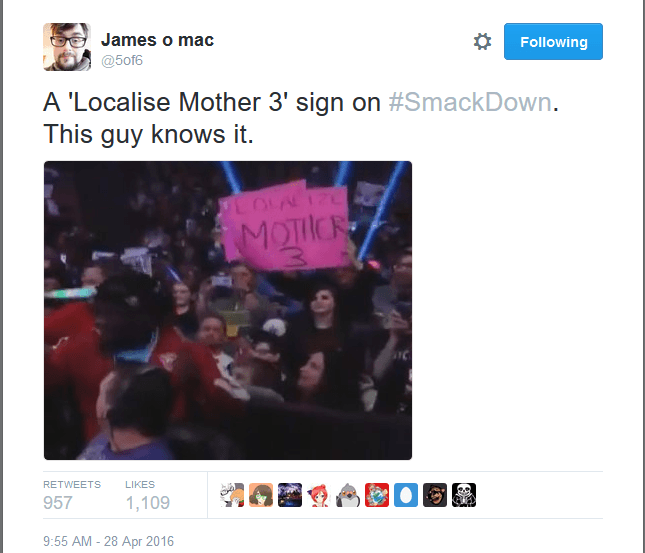 The Localize Mother 3 sign guy. This entry was posted in Games, In the News, Meta and tagged earthbound, localise mother 3, localize mother 3, mother 3, mother 3 sign, new day, nintendo, smackdown, wrestling, wwe, wwe smackdown. Bookmark the permalink.